Right now I’m in Freiburg in southern Germany, at the German military archive. This visit caps off a world tour of archives where I have been gathering information to help piece together the life of the fighter pilot who shot down four B-24’s in 13 minutes on January 7, 1944. Originally, I envisioned Egon Mayer would not play a large role in my first book. But as I looked into the lives and records of all those involved, I realized the story would not, could not, begin with the arrival of the American 389th Bomb Group in England in June 1943. By then, Egon was most likely the last remaining officer in JG2 who had participated in the Battle of Britain. His long and very successful career, and his life, were nearly over by the time the Americans engaged. Between 1940 and 1943, he had shot down dozens of British planes, mostly Spitfires, defended the Scharnhorst and Gneisenau on the Channel Dash, fought in the air over Dieppe, and become the first recorded German to execute the 12 o’clock high attack against American bombers. He was the commander of the Richthofen Fighter Wing, and although he gets occasional mentions here and there, no one has ever really written about him. But who was he? He didn’t survive the war. Without any first-hand accounts of him, and nearly no surviving Luftwaffe records, I set off to see what I could discover of his military record from the Allied side. Egon shot down American planes, usually more than one, on 15 separate days during the war. At the American archives this summer, I scanned in the voluminous files of every bomber group that flew each day, and downloaded the Missing Air Crew Report of each bomber and fighter lost on those 15 days. The Germans recorded plane crashes in their territory in Luftgaukommando reports, which we captured at the end of the war and have never returned. Those got scanned in too. If men survived and evaded back to Britain, I got their Escape and Evasion reports. Preparing the list of days and each group in the air that day took nearly a month. Working six days a week, 12-14 hours per day, scanning the paper files and downloading the digital ones took six full weeks this summer in College Park. It took over another full month to prepare for the trip to the British archives. Egon Mayer shot down British planes on 42 days during the war. In total, I needed over 2,000 files of all the fighters and bombers that flew on those days and at those times, which, luckily, had already been mostly digitized by the British archivists. Mercifully, I was able to download them all in three days in Kew at the end of September. After a weekend in Berlin with friends, I picked up Charley, and we attended the Knight’s Cross meeting, where Charley could spend time with old friends and give an illustrious BBC crew an interview. We then took our time getting down to Freiburg, splitting the driving segments up over days so that we could enjoy a more leisurely pace than our punishing travel schedule of the last years. Charley’s health deteriorated a year ago to the point that I thought he would be wheelchair – bound for the rest of his life. But the frustration and rage at being at the mercy of caregivers, who are not always respectful, compassionate, or kind, has driven him to work towards independence in many of his daily activities. He relearned how to do everything for himself, and refused to be left behind on this trip. With a few modifications, I’m the very pleased beneficiary of his presence. I am inspired and awed by his example. Together here in Freiburg, during misty mornings in the vale of dark, low mountains, we have at least found one tiny segment of Luftwaffe records that survived the war – flight logs of Egon’s 7. Staffel (Squadron) for a couple of months while he was its commander, in conjunction with some claims he submitted in the same time frame. It’s more than many seekers ever find in the ravaged holdings of this forlorn archive. After our three days here, we will return to the Egon’s birthplace near Lake Constance, on the border to both Switzerland and Austria. There we will travel to the mountain where Egon learned as a teenager to fly a crude glider in 1934. Will the vista tell me any more about this enigmatic man? Greetings from the city of Dresden. They say time heals all wounds. And to some extent, that is true for this gorgeous city. Dresden has been working hard to regain its glory since the reunification of Germany, and has made great progress in restoring the loveliness of the city. The Frauenkirche is a good example. Destroyed in the bombing raids in 1945, the pile of rubble that once was the church was declared a memorial to the war by the DDR. After the fall of the wall, the new management decided to rebuild the Frauenkirche along with the city’s central residences and palaces. Many of the old stones were used, but a fair number had to be cut anew. In the astoundingly short time period of ten years, the magnificent Frauenkirche has once again found her place in the heart of the city, crowned by a cross of gold. The donations for this cross came from England, a main impetus from the son of a bomber pilot who took part in the destruction of the city. In 2000, His Royal Highness, the Duke of Kent, handed over the donations which helped to bring forgiveness and reconciliation to a whole city with the restoration of this architectural beauty. But I’m not sure people really know about Dresden. Or perhaps it still seems to carry the taint of the DDR. Either way, we are benefitting from Dresden’s relatively unknown status. Our hotel is a restored baroque noble residence in the Neustadt. Palatial would be the right description, but at a shockingly affordable price – less than that of a mid-range American hotel. If you plan to come to Dresden, now would be the time to take advantage of the good exchange rate and the unbelievable prices. They cannot last long. Our mission here was not as tourists, but to search the Saxon State Archives for the citations for Charley’s father and grandfather, who both won the Saxon army’s highest medal for bravery. We also hoped to find unit histories that would detail the battles they took part in during the 1870-1 war and World War I. Unfortunately, however, these archives, like German archives everywhere, were captured by the Allies and brought abroad before being returned. In this case, the Russians took the archives and returned bits and pieces of it. The bits that were returned did not seem to include anything about the Russian front in World War I, where Charley’s father fought. Now, isn’t that strange? I suppose what we are looking for is buried somewhere deep in the Russian archives, if it exists at all anymore. Our trip started over a week ago in London, England, a bewitching country about which, unlike Dresden, word has definitely spread. Despite England’s many charms, the affordability of hotels is not one of them. Despite this drawback, the English wherever we went were unfailingly polite and charmingly friendly, and our goal of visiting the remaining Sherwood Rangers and their families one last time was all-too-quickly reached. As we drove across the country to meet these old friends, melancholy often overtook Charley. His current physical condition, which was never a factor on previous trips, no longer allows many flights of fancy. It is clear this may be the last time we will be able to see his dear friends – his comrades from the other side, as they are almost affectionately called in German soldiers’ parlance. As time continues to drive us onwards, we realize with heightened awareness the preciousness of every minute of life. This is even more apparent to us as we are about to embark on a most challenging assignment: to find the Russian front battlefields from World War I where Charley’s father fought in what is today central Poland. Unlike France or Belgium, which maintain memorials of century-old battles fought regardless of the winner, Poland has not been keen on preserving many of the painful reminders of World War I or World War II. We are going deep into a land where we have never been before, whose language we do not speak, which does not want to mark or perhaps even remember its last 100 years of battles, without even a unit history to point the way. Only one of the many Polish agencies we’ve reached out to for help in English and German has responded to us – they wrote back in Polish, and in the negative. Now, we have only the names of small towns not far from the Vistula river to guide us. It is a true adventure, one that I view with not a little trepidation, but which Charley insists we take on while we still can. On our way we have planned several days to visit our dear Theresia’s Breslau, once in the German state of Silesia, which was given to Poland at the end of World War II, and is now called Wroclaw. This morning a full measure of sunshine greets us as we awaken in a quiet, small Bavarian valley next to a burbling stream. The cherry trees have exploded in clouds of white and the hot pink magnolias vie for attention before their blossoms fall to the green carpet of grass below. The bees are busy feasting. We are with friends. Winter in Connecticut seems very far away. Twelve days ago I arrived in Germany after flying economy-class on a daytime flight to London. I arrived in Heathrow at 10 pm, stayed overnight in a hotel there, and after a good night’s sleep, woke up to find that my jetlag had been virtually eliminated. In the morning, I simply hopped on a short flight to Germany and went merrily about my business. Why the heck don’t the airlines offer more of these daytime flights to Europe – does anyone know? They are the best thing that ever happened to an international traveler. Once in Germany, Charley and I spent an afternoon on a successful search for the graves of his grandparents and great-grandparents. This may not seem like an unusual activity for an American, because once you occupy a grave, it’s yours for eternity. But for a German, it’s a very strange occurrence indeed to find graves of people who died a century ago. You see, in Germany, the grave you purchase is for a limited time only, say 25 years. And even then, they don’t come cheap. They often include annual gardener fees in the four-figure range, and cemetery maintenance fees that could cause heart failure. Due to the extravagant costs, most families let the plot go after a generation or so, and the bodies are then dug up and…..no one seems to know what happens to them after that. I have asked many Germans, and the question is always followed by a perplexed silence. Perhaps it’s a question no one really wants answered. Our first day on the road was a full day of driving, with a stop for lunch with friends and a detour to the Emperor Wilhelm memorial, the Porta Westfalica, which can be clearly seen from the autobahn, but for which we never seemed to have time to visit. Yup, sure enough, there was a big statue of the guy in the center of a cupola overlooking a pretty river and lush landscape. When we arrived at a meeting of veterans and friends that evening, we spoke to a veteran who was born in 1927 – he was only 17-years-old as he sat in a foxhole during a loud battle deep in German territory in 1945. He never heard the American who came up behind him and pulled him out by the collar. The Americans who took him prisoner didn’t remark upon his youth. I suspect they were quite used to seeing children in foxholes manning rifles and machine guns by that point in the war. We then visited Charley’s tank commander, whom we’ve visited many times before. Despite the fact that I’ve perhaps recorded over 30 hours of interviews with him, and maybe 70-80 hours with Charley, they managed to mention things I’d never heard before over a two-hour dinner conversation. I’m glad I always have a tape recorder at the ready in my purse! The last two days of the week were spent with a paratrooper who fought on Crete in 1941, in Russia, and through Italy in 1944. He’s 96-years-old and sharp as a tack, still driving and getting along on his own. We spent 12 hours per day with him between interviews, scanning in his (many hundreds of) pictures as well as a first-person account of one of his friends, written at the time. It was written in a mix of the current “latin” and the old German script, which virtually no one can read anymore. As I scanned in pictures for hours on end, Charley read the account out loud in front of the camera. Without him, this sort of gem would be lost. This paratrooper’s memory was amazing. I’m always astounded that I can barely remember half the things I need to function daily, and someone twice my age can remember dates, personalities, names, and locations from 70 years ago. Our paratrooper also reconciled with his former enemies and is an honorary member of the New Zealand Crete Veterans’ Association. We love talking to all sorts of veterans, but it’s rare to find someone who was involved in so many battles, can remember so much, has so many pictures, possesses accounts written at the time, and has reconciled with his former enemies. This is the sort of catnip that compels me to come back again and again, although I’m running out of steam, and money. We must face the fact that this is probably the last time we’ll make this sort of trip, with so many new interviews planned. Not because there are too few of these men left. Surprisingly enough, we have so many referrals that we could probably do another 100 interviews, if we had the time and money. No, the main problem is that it’s becoming ever more doubtful I’ll be able to process all the material I have collected in my lifetime. So often recently I’ve had the wish that I could duplicate myself – our friends sent us a list of a couple of hundred of living Luftwaffe guys (we’ll get to none of them), I’ve got a line into Dutch fighters during the war (we’ll get to three on this trip), a historian in America has given me a list of Jewish guys who escaped Germany and Austria at the last minute and subsequently fought for the Americans (gotten to just two of those), and I’ve got a few dozen names and addresses of American fighter pilots that I nearly cry over when I see laying on my desk (another big fat zero achieved). I am just one small person of (ever more) humble means. If you know someone who would be willing (unpaid!) to pitch in on some of these, please have them send their resume to me asap. Greetings from the university town, Jena, in Thuringia. I’d have written oftener and earlier, but to be honest, I’m tired. So tired, I can barely speak German anymore. Luckily, in the adorable, centuries-old bar downstairs next to the hotel, I am reminded that German and English are nearly identical in the most important phrases like: “Good wine!” As long as I keep that in mind, lifting my empty glass towards the bartender for a refill, I’m sure I’ll get through, even though it’s been nearly 8 weeks since I’ve slept in my own bed, eaten a fresh salad from a salad bar, or easily found a parking space. Along the way Charley and I have interviewed: our 96-year-old, highly-decorated battalion commander (for the third time and a total of 28 hours so far! ); the night fighter I mentioned before; a dive-bomber; a “ram fighter” I met last summer; a tanker; a veteran of the fight at Arnhem (A Bridge Too Far); and a flight instructor turned tank hunter. He was easily shot down by the Americans at the very end of the war in one of the Luftwaffe’s slow-moving, old, training planes, the Buecker 181. His mission was to kill a Sherman tank with a rudimentary bazooka get-up tied under his wing from a height of 240 feet. For him, the choice was do that or be forced to fight on the ground with no infantry training at all. He chose flying, was hit on his first “mission”, and took the biggest force of the impact in his body, since there was no effective armor on the plane at all. Bleeding badly, he landed in a field just as an American ambulance was passing by. Hearing his calls for help, the Americans rushed to him. His life was saved, although he lost part of his leg. After hearing this exciting story, we moved on to another ram fighter – one who was trained to ram American bombers instead of shooting them – to bring them down. Way, way down south we met with a HE129 pilot – another tank hunter – but this one an expert by trade, and with a plane developed for the task. Although he had dozens of victories against Russian tanks, and the German Cross in Gold, no one has been much interested in his story. This HE129 pilot was shy, modest, and deeply honored to be interviewed, which is always an immense pleasure for us. We drove on to another veteran of the famous, elite Grossdeutschland unit, slipping in a 94-year-old veteran of the Battle of Berlin along the way, trying hard to get in as many interviews as possible. But it was no use. I was exhausted, my voice started to crack, I was coughing, and soon enough, I found myself very sick in a depressing, disgusting, cheap, but simultaneously incredibly expensive, hotel room in Nuremberg. Meanwhile, friends emailed another long list of pilots to interview. I could only groan. Charley and I cancelled our next six interviews in eastern Germany. I drove us back to Hamburg in two feverish days, stopping at rest stops along the highway to be sick. Luckily, Charley was and is fine. But fourteen days, and a lot of antibiotics later, I’ve hit the road again solo to backtrack for those men I missed, and some we’ve added from the dozens of referrals coming in. I’m feeling much the worse for wear, but feel compelled to press onwards. Two fighter pilots near Berlin to go, then in Hamburg another 94-year-old with six years of combat and thousands of photographs he took himself. With long lists of veterans to get to, we should be ecstatic, but we’re victims of our own success now, with far more names than we can easily get to given the time, energy and money we possess. I am in cranky bliss every day, wanting to stay, but needing to get home soon, especially since I don’t think I can eat any more cake. Ever again. Remember me at the Old Bolds Christmas party, knowing I wish I could be with you. Charley is with me and our starting point today is: Duesseldorf. This is interesting for two reasons: 1) I actually started this trip solo a week ago, since Charley can no longer travel as much due to family obligations; 2) there was a train strike over the weekend which prohibited Charley from meeting me here. Instead, I drove 5 hours to pick him up and then turned around and drove 4 hours back down here with him. I wasn’t good for much except napping yesterday evening, despite the mild weather, which had everyone outside. Yes, it was 21 degrees Celsius at the height of the afternoon, a whopping 69 degrees Fahrenheit. So, due to this extraordinary HEAT WAVE, the heat’s not on anywhere (not even at the Marriott), even though it’s normally been in the 50’s during the day, and in the 40’s at night. This is no problem for the veterans, who tell me that after a Russian winter, nothing feels all that bad anymore. For a southern California girl (and I do still consider myself that now), buying an electric blanket is high on my priority list this morning. On Thursday, I visited a veteran born in 1918 who can still remember just about every name, place and date from his battles during the war (and there were many, many battles). Over the summer we filmed 13 hours of interviews, and only got to 1944. Over two days last week, I was able to scan in his photos, some documents, and get to 1945 with him. But I’m worried about him. He’s feeling so poorly that this time he had to conduct the interviews laying down. I wondered, of course, if we should actually go forward, but he didn’t want to cancel. Up to now, interested men have visited him with the hopes of getting his Knight’s Cross (which could sell for over 10,000 Euros), his other medals, or just about anything they can get their hands on. Years ago, an unscrupulous visitor took his paybook (Soldbuch) with him when he left and sold it for several thousand Euros. Men meet him at veteran’s gatherings, get his autograph on a picture, and write letters to him. Then they turn around and sell his letter back to them (which he asked to keep private and confidential) on the internet for nearly 100 Euros. On Saturday I interviewed a nightfighter who lent his pictures to a respected historian who wrote a book about nightfighters. This historian gave his personal word in writing that all his original pictures would be returned. However, when the nightfighter got his album back, dozens of original pictures were removed and replaced with duplicates (the original white decorative border is now missing on these, and the new pictures are different size from the originals). On the internet, these original pictures could sell for around 10-14,000 Euros in total. And how many veterans lent this man their albums? 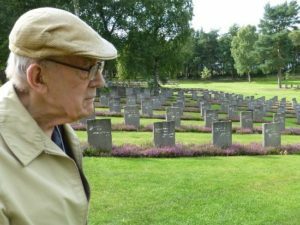 In Germany, almost every elderly veteran is a target for unscrupulous reporters, collectors, and opportunists masquerading as historians, who use and abuse them, steal from them, and betray them. They themselves do often not realize how much their items are worth, don’t believe the police will help them, and are ashamed they were taken advantage of, so they don’t report the abuse. And it’s the reason it’s so very hard to gain their trust. It can take years of showing up to reunions, multiple phone calls from Charley, and the recommendation of other trusted friends to gain entry to these veteran’s hearts. And it makes me wonder about my own motives. Naturally, I intend to write about these veterans sometime in the future, with the goal of selling many books. After all, I am spending tens of thousands of dollars of my own savings to gather these stories while there is still time, and hope to make a living as a writer in the future. So am I any different? I’ve asked myself many times. And I always come back to the same answer. In ancient eastern philosophy, there is a notion of never taking anything that is not freely given. I have found this a useful rule to live by. Sitting on the floor next to my 96-year-old veteran while he lays on the couch, holding his hand and looking into his eyes, I asked, do you want to continue to work with me so that I can write your story? Do we press forward, despite the difficulties, to make sure that what you experienced does not die with you? And the answer is yes. As long as we can, we will push on together. The answer is a relief, and a burden at the same time. There is great responsibility to these men and the world to get this right, to show respect, and to research and corroborate, to ensure accuracy. It is a long, difficult, and expensive road. There are many more men, more interviews in the coming days. And as soon as I can, I will circle back, hoping my 96-year-old is feeling better, can tell me more, and show me more. I am grateful every day for the opportunities presented to me to talk with veterans at home and abroad, for the chance to counteract in some small way any harm done to them, and to serve them and the world by preserving their stories. What was I thinking, planning a trip through France and then two big counterclockwise circles inside of Germany in 60 days with a 90-year-old, and working my “real job” at night? Holy cow! Welcome to Day 46. This afternoon we’re visiting a Knight’s Cross holder, but before we do, we’ve spent a pleasant morning walking through the wonderful spa park in Bad Driburg. Germans love to go to spas – they have a lot of ancient healing waters throughout the country – and their health insurance sometimes even pays for the visit. Too bad we don’t have time or money to immerse ourselves in mud, or loll in the pool. We’re badly in need of some downtime as a result of our grueling travel schedule, but it’s ever onwards. Although some of our appointments have cancelled, we still need to get to the next gentleman. This week we had an appointment with a dive bomber with the Knight’s Cross. Charley had talked to him just over a month ago to set up the appointment. When we called a few days before our arrival to confirm, the number was disconnected. Picking up our young historian friend Jannick (who is 18 and has been interviewing veterans since he was 15), we set out to find our man, come what may. At his house the neighbors, to our relief, informed us he was still alive, and assisted us in reaching the family. That avenue only provided us the name of a home where he had been placed. With a smart phone, we were able to find the phone number and address. In the end, after driving down a god-forsaken, nearly abandoned road, strewn with dead weeds, we found a modest old folk’s home forlornly positioned under a massive, and loud, autobahn overpass. There we dropped in without prior notice, finding our man in a room with his bedridden wife. Although he’s nearly blind, he welcomed us with warm handshakes, and his eyes teared up when I held his hand. He wouldn’t let go while he tried to regain his composure. I wasn’t quite sure if he understood who we were and why we were visiting him, and if the distress came from that quarter, as may happen for folks who have memory problems. But it was much worse than that. He was fully “on board”, as was his wife. At the end of the world, removed to this sad place, they had simply, for all practical purposes, been forgotten. Our quest to find him took him completely by surprise, and he couldn’t hide how much our simple presence affected him. And so we are reminded how important we humans are to each other, how essential love is, how easy it can be to give joy just by showing up, and how necessary it is to offer and receive the gifts of respect and recognition. Here, the antidotes to the ever-increasing, casual cruelty of our daily lives. Where else in the world could you drive 100 mph in the fast lane on a two-lane freeway, have trouble passing the guy in the “slow” lane because he’s doing the same, and have a VW BUS pull up to within 5 inches of your rear end and make hand gestures universally recognizable because you are definitely going too slow? Despite my best intentions, another week has passed before I could put thumbs to Blackberry. I hope you are getting ready for the delightful summer picnic – I know I’ll miss it! Where did we leave off last? Ah yes, with the infantry. We had our second lovely full day this summer with a couple who met and married during the war. He was badly wounded in Russia, and she was a nurse in the hospital where he spent a year recovering. They are still happily married 70 years later. Who doesn’t love a good love story? I certainly couldn’t resist the charm of this delightful couple, and the stories both can tell beyond their romance: he of fighting near Leningrad, Stalingrad, Normandy, and Hungary; she of her duties at a hospital in Thuringia. This week we stayed with our dear friends in Mannheim, who in addition to extending tremendous hospitality and loving friendship, also share our interest in preserving history. Our host has been visiting with veterans and recording stories since 1989, and so has truly awe-inspiring knowledge and contacts in the field. He kindly invited his sprightly 94-year-old neighbor to join us for after-dinner drinks on the terrace, and we were enthralled by this cavalryman’s ability to so eloquently convey the horrors of a war reached on bicycle through Russia in 1941 and 1942. After nearly reaching Moscow, and as the winter and Russian troops both launched a major offensive, he lost almost every person he knew to the cold, disease or combat. Then he himself was wounded. In the hospital and then back at his unit’s home base in Germany, our new friend couldn’t speak at all for six months. What a wonder it was then, that he could speak of it now with such raw emotion, detail, and bitterness. During the week, we continued our marathon of interviews, and visited our cavalry friend at night to hear more. On Sunday, we visited a Stuka pilot who flew with Rudel and had over 500 missions to his credit before war’s end. Monday we spent time with an infantryman who had taken part in the invasion of France in 1940 before being accepted by the Luftwaffe and trained as a ground attack pilot. 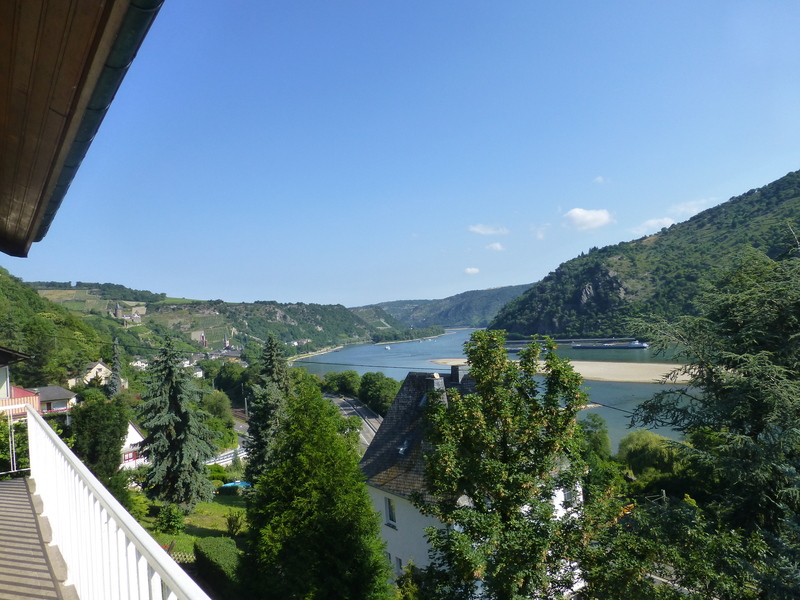 Tuesday we drove along the gorgeous, castle-studded stretch of the Rhein near the Lorelei to meet with a JG11 fighter pilot. On Friday morning, Charley had to take the train home in order to respond to a family emergency, and I pushed on to meet a German historian recommended to me by Andrew. Horst generously introduced me to two fighter pilots, so that I could find out more about German fighter attack tactics. Both pilots flew over the Reich, trying to defend it from Allied bombing attacks. One did so by pledging to bring down a bomber every mission, whether through firing his cannons or ramming it. Unsurprisingly, after the war, the local Americans became his best friends and colleagues, as he accepted employment at the nearby base. Today, travelling solo, I must sadly leave our friends and depart for eastern Germany, where I will meet with two more fighter pilots who fought bombers. As I reflect I realize that travelling, visiting, and working with Charley, learning from him, and sharing his delight in new friends and places has been one of the most enormous privileges of my life. I hope he will be able to join me for the rest of our planned interviews in July. Either way, I can hardly express my the entirety of my gratitude for the assistance he has so wholeheartedly given, the knowledge he has shared, the enthusiasm he has radiated, and the friendship he has granted. I simply would not be able to do this work without Charley’s help, the love and support all of our friends here and my family and friends at home, and the collaboration of many like-minded historians who all believe in the vital mission of capturing and passing history down to future generations. If good friends are a more accurate measure of wealth, then I am truly one of the richest women in the world. Once we got to Germany the fun with pilots began. No no no! Not THAT kind of fun. The sitting-down-and-talking kind of fun. Sheesh, you guys. We started in the Mannheim-Stuttgart-Karlsruhe area, which is working hard at developing LA-like traffic, and doing a damn fine job of it. We were invited to breakfast at the home of a widow of a rocket plane pilot. You know, the ME 163 rocket plane. (For my non-Old Bold friends, a small primer follows) Although the Germans did operate a jet plane in combat late in the war, this was not a jet. This little doozy of a plane mixed extremely volatile rocket fuels together and was launched up to try to take down Allied bombers. Once its very limited fuel supply ran out in a few minutes, the pilot was supposed to shoot down a bomber or two, and then glide back down for a belly landing somewhere. Except that the fuels often leaked and ignited, exploding the plane with the pilot before it could launch. Or it blew up sometimes when it landed. Or sometimes it just blew up. I guess you’re getting the gist. This may be one reason that although jet fighters became pretty popular, rocket fighters never really caught on after the war. I can’t check any facts at the moment, but our widow said that 30 guys volunteered for this unit, and only 6 came out alive. Her husband was one of them. And although he died 26 years ago, she was excited to have us visit her and a Luftwaffe reconnaisance pilot friend for breakfast. When we arrived there was enough breakfast for almost all of the Old Bolds. Our pilot had already eaten, and his limited intake was causing our hostess to feel slighted, as eating is considered the highest form of flattery in Germany. So we had to pick up the slack. After refusing a fourth helping of everything, we got down to visiting with our pilot. Once we had chatted a while, our widow brought out her husband’s photo album, and the clouds parted and I heard a lute playing somewhere. No, really. Definitely a lute. Graciously, this beautiful lady allowed me to scan in his photos, which became more and more fantastic as his career progressed. While flying the FW190, he had used the 21 cm rockets, and taken pictures of them bristling under the wings of his plane. This, of course, was very interesting for me, since I have been researching them in connection with January 7, 1944. Then of course there were some pictures from his time as a rocket driver. Ok, back now. As a historian, it was a pretty considerable find, and thanks only to two amazing historians who set me on the path (many considerable thanks Andrew and Morten). Time ran out, and we promised to return to meet more of the local aviators in the fall. We met the next day with a nightfighter whose memory isn’t as good as it once was. It’s a shame, really, as he and his wife were a really lovely couple. We enjoyed our time with them immensely. And in the last days we’ve met with a JG54 fighter pilot who experienced the Courland pocket, a KG55 bomber pilot who served in Russia, and a flight technician who was posted in Finland with JG5 before he volunteered for the paratroopers and fought in Normandy (all thanks again to Andrew and Morten). We also took a diversion from the autobahn traffic north of Munich and saw signs for Moosburg. Moosburg was the home of Stalag VIIa, a prisoner of war camp built for 10,000, but which housed up to 90,000 Allied servicemen in brutally primitive conditions by the end of the war. It’s the same story in Germany as in America – not much of the wooden barracks have survived 70 years on. Using a helpful website set up by volunteers in the town, however, we did manage to find a fountain that memorializes the camp. Now back in central Germany, we have a pilot planned every day until July 1, starting with a Stuka (dive bomber) pilot who had more than 500 missions tomorrow. Guess I’ll catch some shut eye while I can.